Are you having to space out your front wheels? I saw this is an issue on the fronts with a dakota and viper brembos. I have also read that the caliper position is not all the way on the rotor on the front? Or is that the bracket that is used on the late model spindle? To make a hub, I tossed a regular factory rotor in the lathe and cut off the braking surface. After that, I turned down the outer diameter of the hub so it would fit in the rotor. Once that was done, I put a used Mercedes rotor in the lathe and opened up the center register to fit over the hub. Massaging the bolt holes in the rotor left me with a usable rotating assembly. To fit it to the car, I had to figure out where that monster rotor could sit and clear everything. It turns out there was only one place it would fit and I've got a little under 1/2" of clearance. After figuring that out I grabbed a spare spindle and chucked it in the bench vise. A little chunk of 2x4 wood became my caliper bracket. I hacked it up until the caliper fit the new rotating assembly. When the parts fit, I stuck a chunk of steel in the vertical mill and copied the wood mock-up. When doing something like that you have to know where EVERYTHING fits and make sure that there is no contact when the suspension moves and you turn the wheel. Having a laths and mill at home isn't necessary but it sure makes it easier to build stuff. you'll either have to turn every rotor to clear the hub when you need to replace rotors, or turn the hub and replace it. or, turn the hub, and when the bearings go out, replace just the bearings. it is easy to swap the whole hub since that's how it was designed, and entire hubs are available for sale, but you can also get just the bearings and replace them, keeping your hub. I'm going to try to do mine on the "cheap" and with the hub mounted, use an angle grinder to remove metal while turning the hub as the grinder makes contact. might take me an hour or so per hub, but it's "free"
unless I find someone who can turn the hubs down for cheap, like $40 each. then it might just be easier to have them do it. trying to picture what you did...so you cut an entire rotor down so it became your new 'hub'? have pictures at all? if you wear out a rotor, what do you have to do? grab a new one out of the box and bolt it on? or do more lathe work? Yeah, I dont have a mill or a lathe. I wish I did. Someday! But I do have a router table! I can make a wood or acrylic proto and wnen it fits, I can have it copied at a machine shop. I have lots of acrylic. probably better than wood for making a proto like that. Good thought, and that I can do. That was one of my thoughts on it too, and another thing is I am running a 28 inch tire out back with a smaller tire in front, so it might be of benefit. One of the things I have to know is if I can look at it, or if it even bothers me. yea, you can run a big tire up front, and I prefer wide tires up front for turning and braking, to go with my wide tires in the rear for acceleration. I like to use as wide of a tire that I can fit...within my budget too. my 275/55s are a tad too tall for me though. I want 275/50s at 28" tall. if I can't find them in my budget, then I'll be going with the federal 255/55s, stock size, 28" tall, and just over $100 a tire. Look at that again. You haven't even mounted the tires on wheels and you've already got a road kill! 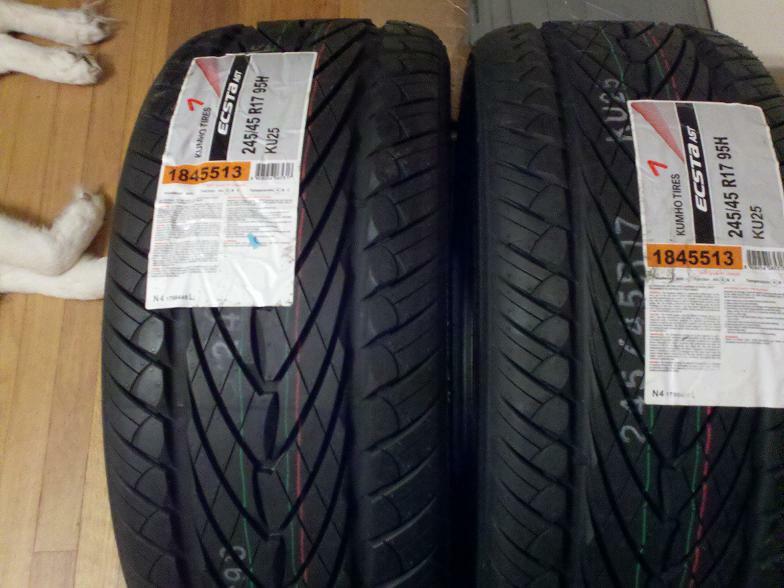 Seriously though, tires are a big part of a brake upgrade. I went from 235/60-15 and 275/60-15 BFG Radials with S speed ratings to 245/45-18 and 295/45-18 Nitto NT555s with W speed ratings. There is a WORLD of difference. Stopping, starting, and turning ALL greatly improved with the tire change. I had them on the car before I installed the new brakes. Attached is a pic of the car with 11" disc brakes and the new rolling stock. As for your rear ABS taking up the slack, remember that the ABS works great but it also dumps lots of heat in those brakes. They'll work fine for a while but if the brakes can't dissipate the heat they'll lose stopping power. That's one idea behind large rotors. Not only does the larger diameter give you a longer lever arm but it also means more surface area to spread out the heat. My rotors (and Ozhemi's since he used the same thing) weigh 27 lbs each. That's HUGE. However, I have not been able to overheat the rotors with enthusiastic street driving or lots of brake boosting on the highway. OZ, what did you use to cut that steel? I'm assuming a mill. hehe those are alaskan malamute hooves. She's never too far away. Good thoughts on the ABS. The beauty of this truck is every last ounce of computer controlled "goodness" is gonzo! No more ABS, no more efi. I am fully in command. The ABS and EFI in this truck were horrible to work with and drove me nuts. I will not be reaching any kind of crazy speeds as I am using a 727, so I dont think I need anything necessarily exotic for tires, but yes, the footprint is important. I want it to stop, not slide. A good hotrod can stop as well as it goes, and when it rains, not be crippled to 45 mph on the highway with everyone shooting you the bird. That's exactly what I did. I was going to use drum brake hubs but mine disappeared, probably to the recycler. No, I don't have any pics. I'm really bad about getting carried away in the garage. Unless I make a real effort to take photos I will move right along from one step to the next without stopping. Call it Mad Scientist Syndrome. When the rotors need replacing, I will have to chuck another one on the lathe and open up the register. I can tweak the lug holes by hand. No machine work is needed. The Mercedes use a 5 on 112 mm spacing with 14 mm lug bolts. The Belvedere has 5 on 4.5" (114.3 mm) spacing with 1/2" (12.7 mm) lugs. The spacing works out pretty close. Not much work is needed there. I would advise against using a router on steel, carbide bits or not. The little bits of flying steel swarf will find it's way inside the router and lay waste to the motor. It's just not a good idea. You can do smooth lines like Oz has with careful use of a bench grinder. A hand grinder would work also but it would take a bit of time. If your brackets aren't going to be all funky like mine you can probably get a shop to cut them on a water jet or mill. A rough cut is fairly quick and easy. Get that done and you can make them pretty at home. I won my mill on eBag. Here's what it looked like when I got it home. The lathe is a bit heavier and a more interesting to move around. I used my brake upgrade as an excuse to buy it. It's come in handy for all kinds of stuff but I'm a tinkerer by nature. Here's the Pratt & Whitney when I got it home. To smooth it all, I used my Oz-made multi-tool...basically a belt sander sorta thing made for metal that uses all sort of different grade belts. (It mounts to a bench grinder motor) I use it constantly for everything...a great thing I bought many years ago. Oh, and on the rotors...since I went with 5 on 4.75" bolt pattern I needed the rotors redrilled. Which is no big deal and when the time ever happens to come I need to replace them will just get it done again. My car is quite light though so figure the rotors should hold up for a while perhaps. I would like to someday run (just for the heck of it) the same 8 piston calipers as Feets has...just need to wait for a deal on a pair. The fit and finish of the brackets really had me fooled. I was under the impression you had a mill and lathe too. Nope, just lots of work ethic...just as good! Takes a little longer, but the end justifies the means. Phew! I dont feel so alone now! With having to space the wheels out.. I checked around on rock auto a bunch to sorta start with since they have rotor sizing for most of thier part numbers. My first "easy" idea was to use 14" Z06 Corvette rotors...but they were way too 'flat' and not enough rotor height to have the caliper clear the spokes in my wheel. I just got some AP Racing calipers in the mail a couple days ago too and sorta held one up to the front on my car..they are kinda cool looking as well actually...but they are boxed up now and gotta mail them off to a guy in Oz on Monday. "Honey, I'll be right back, I am just running out to pick up a tool I need...."
Believe it or not though, I am seeing all kinds of stuff like that around here for sale, and for cheap. I should look into a vertical mill at a minimum. Thank you...and would be nice to have those other tools, but just have to piddle along with what I do have. I've made alot of parts for the Torana build and been happy with how they all came out. I did the exact same thing. I got the deepest rotors I could find but still had to mess with the spokes on the wheels. FYI... Rock Auto has the AMG calipers for $266 each. If you don't have a core to send in it'll cost an additional $300 but that's chump change for a guy like you. Shops going out of buisiness is a great place to pick up a deal on equiptment. I got my Snap-On mig welder a while back (wow...now that I think about it, it's been about 12 years ) and it was maybe a year old at the time and barely used..it was a tire shop I used to deal with that thought he was going to get into custom suspension work and just gave up on it all after a year and sold all his stuff off for next to nothing. Sure with how things are going there are plenty of smaller shops around getting rid of mills and stuff too...but my garage is running out of room.